There's not much to this recipe since I came up with it on the fly. I'm all for encouraging folks to use what they have on hand and to not be afraid to substitute if needed. I think coming up with a dish in an 'Iron Chef' fashion makes cooking more fun and challenging at the same time. This recipe is open to adaptation (as is all recipes, really) and some suggestions I have include adding some chopped sun dried tomatoes, using mascarpone in place of cream cheese, mixing in toasted pine nuts for texture, and using other Italian cheeses like Parmesan, Asiago or event Fontina. The ideas are endless so have fun! Preheat oven to 350 degrees. Lightly coat a 9x13 baking dish with cooking spray and set aside. Cook the pasta sheets as directed on the package and allow to cool enough to handle. Meanwhile, in a large bowl, combine the chicken, pesto, cream cheese, and spices until fully incorporated. Place a layer of cooked and cooled pasta on the bottom of the prepared baking dish. Top with a light sprinkling of cheeses enough to coat. 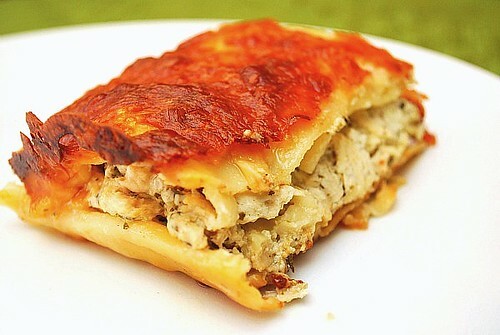 Layer half of the chicken mixture over the cheese and top with a layer of more pasta. Repeat layering with a sprinkling of cheese, chicken mixture and pasta. Cover the top of the pasta with the remaining cheese and bake uncovered in the preheated oven for 30-35 minutes until cheese is melted and browned. Since everything is already cooked, baking will just meld the flavors and warm everything up. Allow to cool for 5-10 minutes before serving. Yum yum!! I love any lasagne. This especially sounds delish! Given how much we enjoyed your Chicken Parmesan Meatloaf, I think this recipe needs to be made soon! Keep 'em coming, Joelen :).